South African all-rounder David Wiese has linked up with Sussex six weeks ahead of schedule. 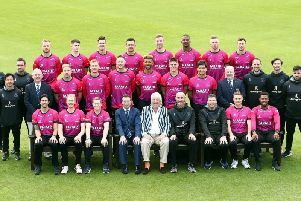 Wiese, who had a spell with the county as overseas player in 2016, flew in on Wednesday morning and a couple of hours later was with his team-mates at Hove for Sussex’s pre-season photo call. He is likely to figure on Friday when Sussex complete their pre-season preparations by taking on Cardiff MCCU at the 1st Central County Ground. Matt Machan (wrist), Luke Wells (knee) and Ollie Robinson (shin) have all been ruled out of this game and their fitness for the opening Specsavers County Championship against Kent at Hove on April 14 will be assessed next week. Wiese was not due to arrive because of IPL commitments, but he failed to pick up a contract with Royal Challengers Bangalore and was quite happy to head to Sussex earlier than scheduled. The 31-year-old said: “I was just kicking my heels so when Davo (Mark Davis) got in touch it was an easy decision to make. Luke Wright will lead Sussex against the students and after an injury-ravaged first year in charge he is raring to go. “To be honest, fitness-wise this is the best I’ve felt for six or seven years,” he said. “The wrist and back problems I had last year have gone, I had a really good winter and I can’t wait to get started. “We’ve definitely got a stronger squad and I like the competition we’ve now got for places in all areas of the team. The signings we’ve made – Stiaan van Zyl, David Wiese, Laurie Evans and Vernon Philander – have strengthened us in a key area because three of them can bat and bowl and they can all play in the three different formats. Last year we struggled to balance the team, especially in one-day cricket. Philander is due to arrive next Monday and will make his debut against Kent.